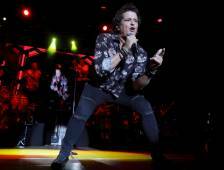 Carlos Vives presented his new artistic project, a five-episode documentary in which he toured the country, visited six local musicians for the purpose of "searching for sound colibration". Documentary & # 39; Colombia en una canción & # 39; shows Vive's collaboration with local artists representing different areas of the country, said the singer-songwriter's office in a statement. The five episodes, four minutes each, are played by musicians from the Caribbean department in La Guajira, on the island of San Andrés, in the town of Palenque de San Basilio, in the eastern plains region and the Colombian Pacific Ocean. Among the participants is the singer of the llanera music Orlando "el Cholo" Valderrama, the winner of Latin Grammy in 2008 in the category Best Folk Album, and harmonist Egidio Cuadrado, crowned vallenato king in 1985 and partner of Vives since 1991. The documentary also brings together modern genres of Colombian regional music with the purpose of presenting innovative pieces of "carranga rock", with Velo de Oza; "Caribbean people", with singer Elkin Robinson, and "hip hop de Palenque", with the band Kombilesa Mi. The images chosen to follow these musical suggestions are the landscapes of each region visited by Vives during the film of the documentary year last year, as well as the various informal conversations that took place between the artists. "The music has the role of recognizing and including us, we have to work on what connects us, not on what sets us apart, and what is better to do through the rich sound we have in Colombia," said the singer-songwriter. Vives, winner of 11 Grammy Latino and Two Grammy, is nominated for five statues at the Lo Nuestro Awards gala, which will be held on February 21 in Miami.